Most of the telecommunications in Nigeria are now migrating from existing 2G and 3G services to genuinely high-speed mobile broadband on 4G/LTE and this is time for us to dump outdated 3G network and moves forward with 4G LTE network. 4G LTE allowed smartphone technology to spread its wings. That’s because it’s much, much faster than 3G. So when you want to download the new game or stream a TV show in HD, you can do it without buffering and legs that make the experience not worth the wait. Using a 4G smartphone with 4G LTE network means you can download files from the Internet up to 10 times faster than with 3G. Based on people's comments in the previous post about 4G LTE, we noticed that lots of people can't different if their smartphone is 3G or 4G enabled device, now we are here to sort it out. Whether you are using Android smartphone, iPhone, Windows Phone or even a Blackberry device, you can check if that your mobile phone support 4G network. The steps are very simple, just follow it accordingly. Go to Settings >> Network Settings >> Mobile Network. 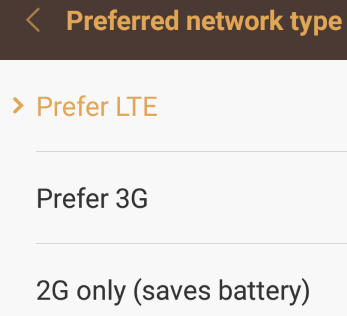 It should give you a drop-down menu of mobile standards such as 2G, 3G or LTE (4G). If you don’t see 4G or LTE, then your smartphone doesn’t support the standard. Go to Settings >> General >> Cellular >> Enable 4G LTE. Go to settings >> Network and Connection >> Mobile Network >> Network mode and you’ll see 4G&3G&2G. however, if you are using Blackberry Q5 and below, you won’t get 4G network services. Go to Settings > Celluar + Sim > Highest connection speed and check if LTE is part of the options. Once you’ve seen the 4G network, simply selected LTE and if the network is available in your location, the “LTE” symbol will appear on the phone status bar replacing either “3G”, “H” or “2G” symbols. Then you can start flexing on 4G network.